Our popular BASview building supervisor is now faster and better than ever. With the release of the BASview2, we are now using HTML5 instead of Flash, allowing the BASview2 to work seamlessly on smart phones and tablets. We also gave it a large speed improvement from 200MHz to 1,200MHz so screens load instantly. The fast speed comes with the same easy set-up and programming. One of our customers told us they love the BASview because "you can use the BASview to do an application without attending a 5-day training session and passing an exam." 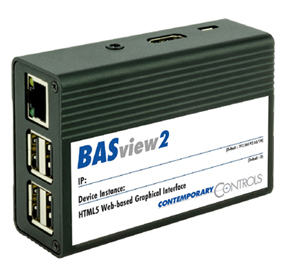 It's easy to understand and configure a BASview2 using its stand-alone, embedded, web-based graphical interface. No special software required. Supporting up to 2,000 nodes, the BASview is ideal for small to medium applications that require a simple-to-use graphical interface with no licensing requirements. The BASview2 can be accessed from any web browser — providing client functionality to any BACnet/IP or Modbus TCP system. By using Contemporary Controls BASrouter or BASgateway products, additional protocols such as BACnet MS/TP and Modbus RTU are supported. The BASview2 is simple to install and use. A 10/100 Mbps Ethernet connection is all that is needed. Client features include animated graphic screens, scheduling, historical trending, runtime accumulation and alarm monitoring. BASview2 will automatically toggle outputs and change setpoints on schedule, collect runtime and trend data, and monitor alarm conditions. "Customers like the BASview because configuration is so intuitive," said Joe Stasiek, Sales Manager. "If you are using BACnet you just discover the BACnet devices, and then discover the BACnet points. Now just drag the points onto the trend charts, into the alarms, the scheduling screen, or onto the graphic components. You can also use the template facility to duplicate repetitive functions like trends and graphics to minimize development time." As an embedded device, BASview2 uses Flash memory for internal storage instead of a hard disk to maintain its ruggedness. The BASview2 is totally self-contained, requiring no external PC or application for its use. Any number of web browser users can access the device. Visit the BASview product page to learn more.